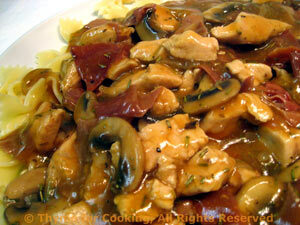 Turkey with Sherry and Prosciutto, Weekly Menu Planner. This is a slight variation on the traditional 'Newburg' using dry, air-cured ham in place of bacon. I think the ham adds more flavor and a subtle woodsy tone more complex than the bacon. 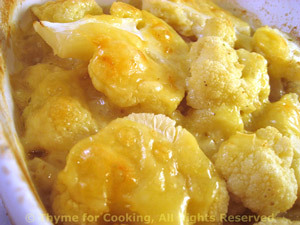 Sliced cauliflower, sprinkled with shallots and topped with cheese: a simple gratin. Break the cauliflower into large florets, then slice thickly. Shred cheese or cut into thin slices. Lightly oil a small glass baking dish. Lay half of the cauliflower evenly in the dish. Sprinkle with shallots and top with remaining cauliflower. Pour the chicken stock over the top. Cover with a lid or foil and bake, 400F (200C) for 20 minutes. Uncover and bake for 10 minutes longer, to brown the top.